The redbrick classical-style building, designed by Kiene & Bradley Architectural Partnership of Topeka, was dedicated May 14, 1983, in the centennial year of the Alumni Association. The association had been housed in Fraser and Strong halls, Sudler House and the Kansas Union before the new center was built. 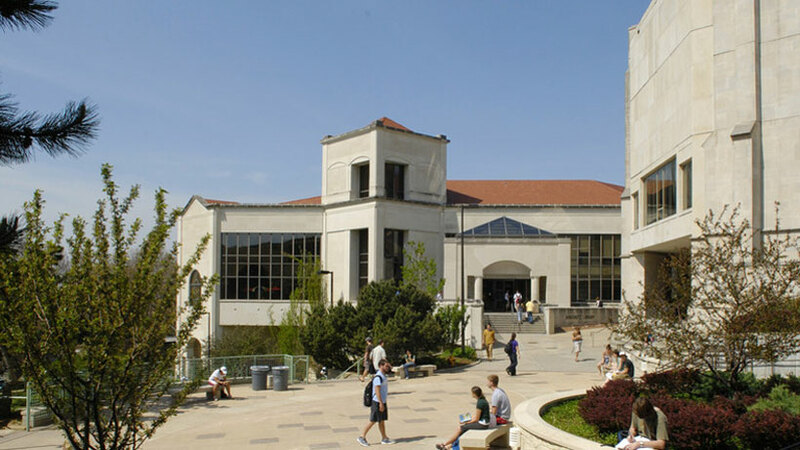 An alumni fund drive raised $4.2 million for construction, and the KU Endowment Association donated a site northeast of the Kansas Union. 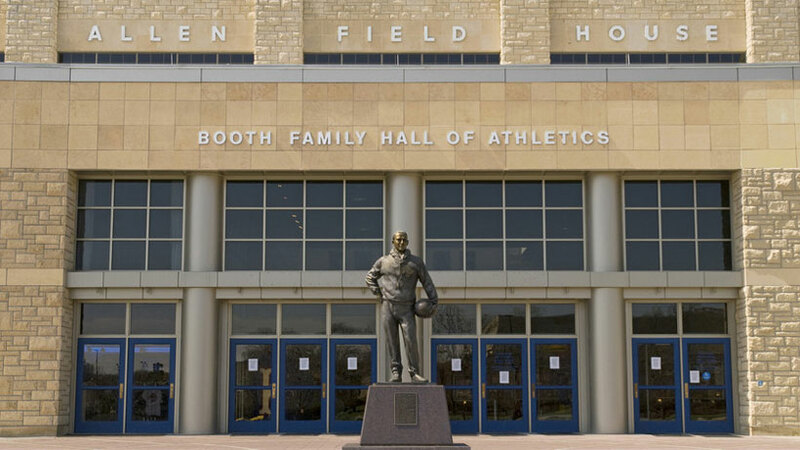 The fieldhouse, which opened March 1, 1955, is named for Forrest C. "Phog" Allen, the notable KU basketball coach who played for and was trained by James Naismith, the game's founder, a longtime KU professor of physical culture and its first basketball coach. The fieldhouse and its basketball court, named for Naismith, superseded the facilities at the original Robinson Gymnasium, built in 1907 and razed in the late 1960s; and Hoch Auditorium, where games were played from 1927 to 1955. Like those venues, the fieldhouse also has been the site of concerts and university functions. Opened in 1989 directly north of the fieldhouse, and connected by walkways, it also houses the Parking & Transit department office. John and Virginia Walsh Eulich of Dallas, both 1951 alumni, commissioned this version of the Jayhawk for the Adams Alumni Center, 13th Street and Oread Avenue. It was dedicated Nov. 19, 1983, about six months after the center opened. At the suggestion in 1953 of Chancellor Franklin D. Murphy, this large cast-stone fountain was purchased with $1,300 in private funds from the Erkins Studio in New York. It was placed in a circular terrace surrounded by three benches at the south end of Alumni Place; Facilities Planning landscaped the site, near the retaining wall behind Miller and Watkins scholarship halls. Increasing demand for both educational and recreational sports facilities spurred the decision in the late 1990s to build a new student center. The $17-million facility south of Watkins Memorial Health Center, funded by student fees, was dedicated Sept. 25, 2003. In December 2007, it was named in honor of David A. Ambler, the longtime vice chancellor for student affairs who was a strong advocate for a new recreation fitness center. Named for Koli K. "K.K." Amini, a 1949 petroleum engineering graduate whose gift of $1 million funded its construction, the hall was built in 1992. It is coed, housing students in three- or four-person suites. 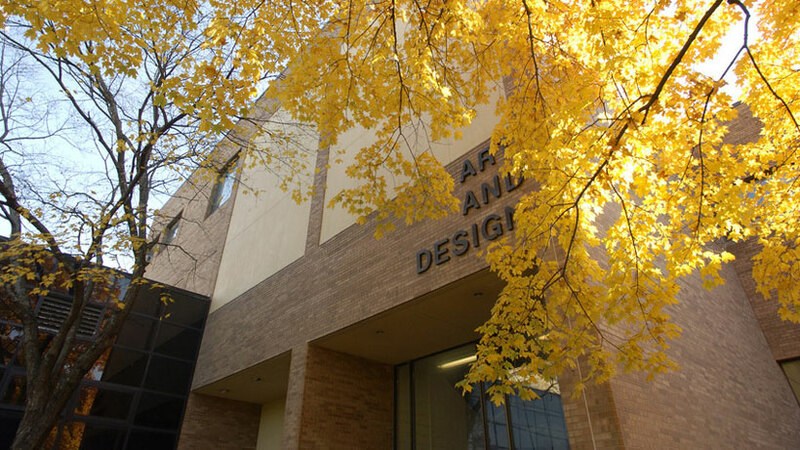 Gould Evans Associates of Lawrence designed it and its twin, Margaret Amini Scholarship Hall for women. Named for Margaret Wenski Amini, 1946 journalism graduate who with her husband, K.K. Amini, gave $1.5 million for its construction, the hall opened in 2000. It houses women and is the architectural twin of the adjacent K.K. Amini Scholarship Hall for men. The $31-million football complex adjacent to David Booth Kansas Memorial Stadium opened in August 2008. HNTB Architecture of Kansas City, Mo., oversaw plans for the 80,000-square-foot complex that includes academic areas; locker rooms; facilities for weight and cardio training, hydrotherapy, audio-visual screenings and nutrition; coaches’ offices; two adjacent practice fields; and parking lots. The roof of the weight room, about 20,000 square feet, is bermed into the hill to the southwest of the stadium and covered with grass. 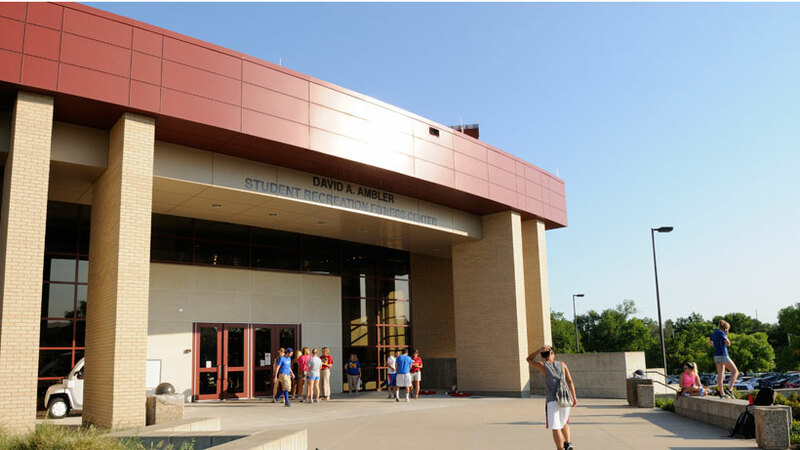 The center is named for Dana, a 1959 business graduate, and Sue Anderson of Los Angeles and their family, longtime KU supporters and chief donors for the $8 million, 42,000-square-foot facility. It was designed by HOK Sport of Kansas City, Mo., and built at the northwest corner of Anschutz Sports Pavilion and opened in 2003. It is used by all athletic department sports and houses the strength and conditioning department staff offices; weight, exercise and conditioning rooms; and conference and tutoring rooms. Dedicated Oct. 7, 1989, it is named in honor of Fred and Marian Anschutz, parents of Philip Anschutz, a 1961 business alumnus and entrepreneur in telecommunications, entertainment and media companies, sports teams and arenas, railroads, and real estate. He and his wife, Nancy, gave $6.5 million for an endowed library acquisitions fund. The 40,000-square-foot pavilion houses practice areas for football, track, softball/baseball and soccer; the Ray Evans Football Field and the 200-meter, six-lane Bill Easton Track practice areas. The pavilion is named for Fred Anschutz, a 1933 alumnus and oil-company owner who was its chief donor, and was dedicated Oct. 27, 1984.